Greetings from here, it is another day in CBIW where we have just started making history as we welcome the coordinator and the second foreign lecturer to come over to CBIW to help train men to preach. Join the church here in Wotutu, and the host of angels, for sister Gladys Moitti who accepted the gospel on Wednesday after our Bible class. Accept our warmth greetings from this end. On behalf of the students, staff and members of the Wotutu congregation, we wish you the best of life this week. Our week in CBIW went on well. Tuesday the students took their last exams on the gospel of John marking the end of the long courses for this first year. Many thanks to God for standing by us through the ups and downs this first year as we plan to end with these two short courses. As I mail you this report, I am just returning from a 90 kilometers trip with the coordinator of CBIW from Bear Valley. He made his way to Cameroon safe and sound on Thursday night and he is presently reporting well. Our prayer and our appeal for your prayers is that you keep him in your prayers for his stay here to be smooth as he helps train men to preach the gospel to save souls. He taught this morning in the Etam congregation, where our students used to visit for campaigns and weekend evangelism. The service in the Wotutu congregation was great in our absence. Keep this work in your prayers. Josh preaching through our PA system to the Wotutu population and the nearby villages through the program we call back to the Bible. The gospel is meeting more people in their beds early in the morning from 5:30 to 6 am, Monday to Saturday. This week we are talking about sin, so he talked about how people can control their sinful nature. He did well. As I write this mail to you it is 8:45 am, meaning that brother Josh has been in class for 45 minutes lecturing from the book of Galatians. I can hear him from my office, but after this mail I will join the class and keep adding to my learning. It is a great opportunity for me to learn more, either from my office or sit in the class live for few minutes and I jump out to do one or two things. Brother Josh had no time to rest after a long flight from the USA. He will finish the course soon, while the preacher of Bear Valley will come and continue to teach Leadership to the students and others around. I set the room up for Josh to be comfortable a bit far from home. I made a new bed and put into the room because another lecturer, minister Neal Pollard, will come next week and both of them will be there till they finish the work the Lord has entrusted in their hands to come over. 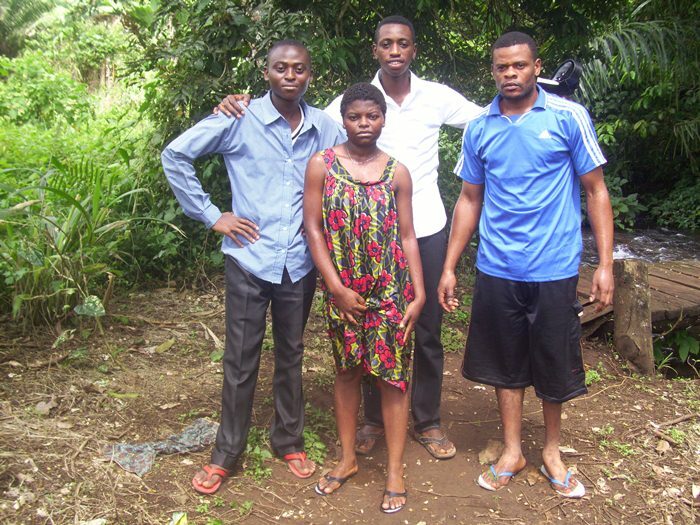 On the lower right is a picture of sister Gladys and some CBIW students who performed the baptism. Keep her in your prayers that she walk worthy of her calling, so that some in her unbelieving family will embrace the truth shortly. We also suspended our evangelism for now as our students are so involve in these short courses even on Saturday. We already started sowing the seeds in mile four where we are looking for possibilities to established a congregation. Keep the work in your prayers. 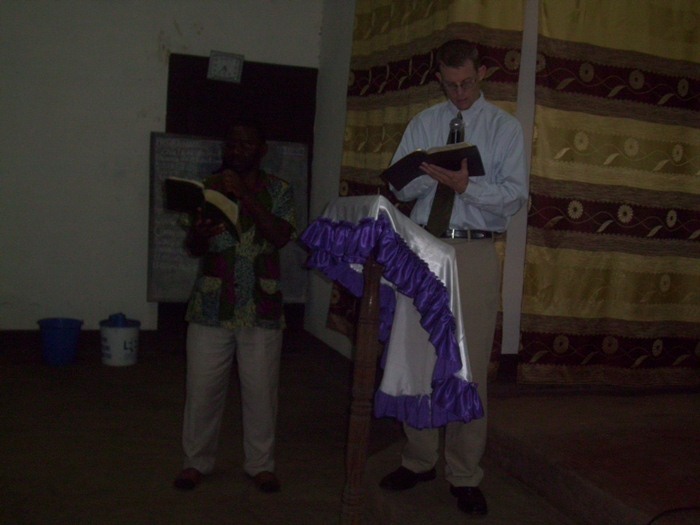 All is set for the annual Bible lectureship in Cameroon. By His grace our students will be part of it. Many thanks to you and your family for the wonderful concern, prayers and priceless support in many ways to see this work in progress. God alone will reward you. I pray you faint not. Many thanks to God for my son and wife who were sick, but are getting much better now. God bless you as you share this report with others. Posted on November 13, 2011 by Bob Turner and tagged Cameroon.